Unshackled from any free-to-play hooks and microtransactions, Pac-Man 256 is one of the most addictive experiences found on consoles. While it's disappointing that this premium version didn't make its way to the Vita, a new multiplayer mode makes it feel at home on TV screens. While Pac-Man isn’t the only arcade game to have a kill screen, it certainly has the most famous one. Players that were good (and dedicated) enough to reach the arcade cabinet’s 256th board would find that the level was unable to be completed. This was due to a glitch that made half of it unplayable, with the right side being entirely composed of of random letters and symbols. Pac-Man 256, which launched last year as a free-to-play mobile game, uses this iconic level as the basis for an endless runner starring Namco’s mascot. Now the iOS and Android hit has released on PlayStation 4 and Xbox One. As such, console players can now experience the core gameplay loop that combines the signature Pac-Man gameplay with the omnipresent threat of a kill screen that constantly chases Toru Iwatani’s creation more vehemently than any ghost ever did. Designed to be played in short bursts, Pac-Man 256 is the best high score driven game I’ve played in quite some time. Since the kill screen is always coming towards the player, it forced me to constantly make my way up its neverending board. After early attempts where I made the mistake of rushing my way forward, which ended with me running head first into ghosts, I learned that I had to balance my speed with smart play. I constantly got better the more I played, and a large reason why was because I started recognizing the patterns that each ghost had. I noticed that the pink ghost (creatively named Pinky) would dash at the player, but only moved if he saw Pac-Man. Every ghost has a pattern (such as ones that turn at the first possible opportunity), and my ability to remember these led to better runs as I could predict how the enemies would react before they did. 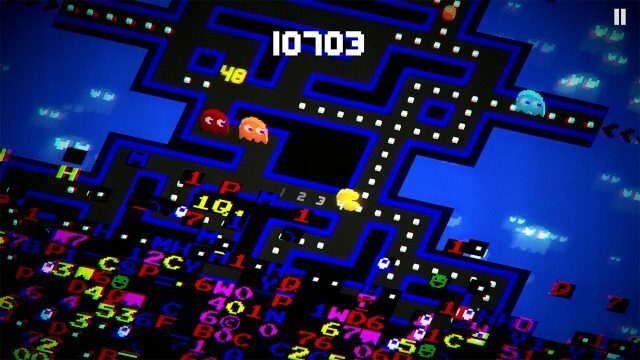 Since this is a Pac-Man game, the score is gained by eating pellets. 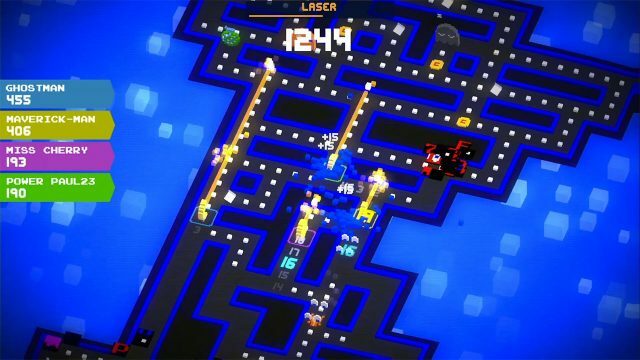 The gameplay is nearly identical to the arcade game (there’s even exits that allow Pac-Man to escape to the other side of the board), but additional nuance has been added in to make it feel fresh. Fifteen new power-ups have been added, and these temporary boosts range from lasers that destroy ghosts to the ability to soawn tiny Pac-Men that chase away enemies. All of them are fun to use, and help make the game feel like a true evolution of one of the industry’s most popular franchises. Other than pellets, coins are also spread throughout the board and can be collected. These can then be used to enhance the effects of power-ups (such as making the laser last for a longer period of time), and add a great sense of progression to the game. This means that the more you play Pac-Man 256 the better odds you have at having a great run, although skill is always the determining factor. Sometimes players will also be randomly gifted some coins for playing, which is a standby from its mobile roots where ads would be shown in exchange for coins. Still, even though I love Pac-Man, I did get sick of seeing the yellow blob’s face after several hours. 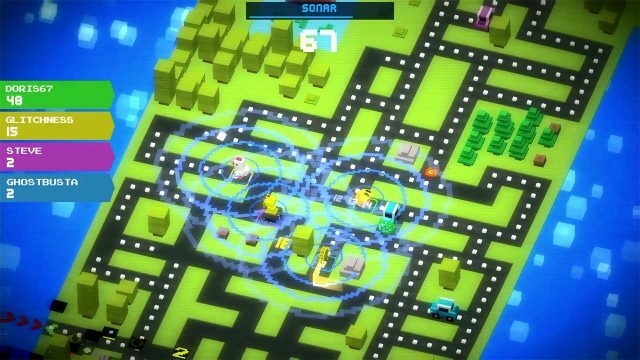 Thankfully, there are 10 different visual skins to equip that range from the game taking place in a go-kart track to looking like Crossy Road. There’s also the option to put the skins on shuffle, and get a random one each time a game is played. This variation is great, and constantly kept me engaged. Rounding out the package is a brand new multiplayer mode that allows up to four players to play cooperatively, and makes for a very fun experience. Plus, while the game certainly gets busy with four players (it feels more manageable with only two), I never found it hard to keep track of my character. It’s also worth noting that this mode is local-only, although PS4 owners can use Share Play in order to play online. Pac-Man 256 is a better console game than it is a mobile game and that’s really saying something. Devoid of any in-app purchases and ads to watch, the gameplay gets to truly shine. Addictive in short and long bursts, this is easily worth the $4.99 asking price. This review is based on the PS4 version, which we were provided with.